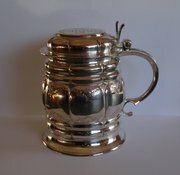 DescriptionA very good Antique Victorian English Sterling Silver Presentation Lidded Tankard by Daniel & Charles Houle, London and dating from c1865. 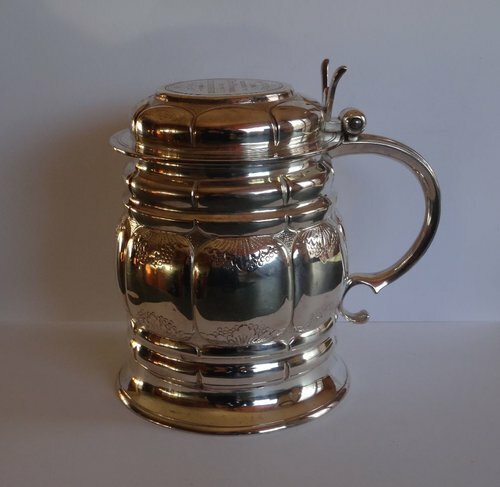 The tankard is hallmarked on the underside of the base with the maker's mark "DH/CH" for Daniel & Charles Houle, the Lion Passant Sterling Silver Mark, the Monarch's Head (Queen Victoria) duty mark, the Leopard's Head London town mark and date letter "k" for 1865/66. Also hallmarked on the inside of the lid. 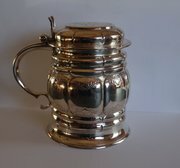 The lid with a later engraved presentation inscription, having been won at the Wilton Sheep Fair : "Wilton Fair 1896, Presented by the Earl of Pembroke, for the best 100 Wether Lambs won by George Blake" This is a very good example and in excellent condition. It measures 5 1/2" inches (135mm) in height. The base just under 4 1/2" inches (112mm) in diameter. The weight is 435.1g/15.35oz/13.99ozt. Deveron Jewellers are specialists in Antique Pocket Watches & Vintage Wristwatches, Jewellery, Silver (including Scottish Provincial),Good Quality Antiques & Works of Art. The SAAC, Scottish Antique and Arts Centre, Abernyte, Perthshire PH14 9SG.